Owning a Heartland fifth wheel just got easier. Heartland brings a reputation for providing high quality RVs to families, that will last for years to come. When you buy a Heartland RV you get the peace of mind that comes with having such a high quality RV. Here’s a snapshot of what’s available during our Red Marker Double Discount Sale. This fifth wheel sleeps 9 people and measures 33′ in length. It boasts a 53 gallon fresh water tank, 80 gallon grey water tank and 40 gallon black water tank. In the living room you’ll find a 32″ LCD TV that makes enjoying your favorite movies or TV shows on the road enjoyable wherever you are. The front bedroom holds a queen sized bed with storage above. The kitchen holds a refrigerator, a three burner range with a microwave above and a double sink. At 31′ long the 278TS sleeps 4 people. In addition to a large bedroom with a plush queen sized bed, night stands and overhead storage, there’s a huge side aisle bathroom. It comes with an angled shower, toilet and sink. If you enjoy cooking you’ll appreciate this luxury fifth wheel’s spacious and well equipped kitchen. It comes with high end appliances and ample storage. 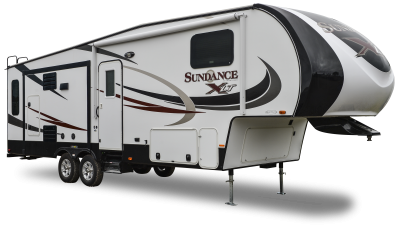 With room for up to 4 people, this 28′ long fifth wheel is compact and easy to tow. The living room was designed for comfortable living and includes two rockers along the back wall. You have the option to add a 32″ LCD TV in the living room. In the kitchen you’ll find an island with a double kitchen sink. The front bedroom includes a slide out queen sized bed and a wardrobe with sliding doors and a space for washer/dryer. If you’re interested in learning more about the incredible deals available during the Red Marker Double Discount sale, contact us or stop by one of our two New York RV dealerships. Our experienced team can help you find the best RV for your needs.